A quick but important update this week!! Although the season on the field has finished for Milo, U10, U12 and U14 and our Girls teams, there is still lots happening at Nunawading Cricket Club! As mentioned in our Club Rooms last week after our games, our U16 Boys have made the Grand Final (after being undefeated all season). Tomorrow night, they are playing the first night of their two day Grand Final at East Burwood Reserve. If you are able to, please come along for a 5.00pm start (the game will go through ‘til about 7.45pm) and support Buddy and the Young Men. It will be a great night weather wise. After the match, I encourage everyone to come back to the club and join in the festivities for a bite to eat and drink!! – Good luck boys!! · 5ths – Highfield Park (Surrey Hills) – this team has featured Pete Jessup, Brad Gant, Jean-Paul Lefebure, Chris Maguire, Mal West and Rob Nash throughout the season – and a number of U14 and U16 boys!! I know there are others who I have missed – Peiter, Tim and many juniors who will be all involved in the teams. Let’s cheer on the ‘boys’ over the next few weeks. 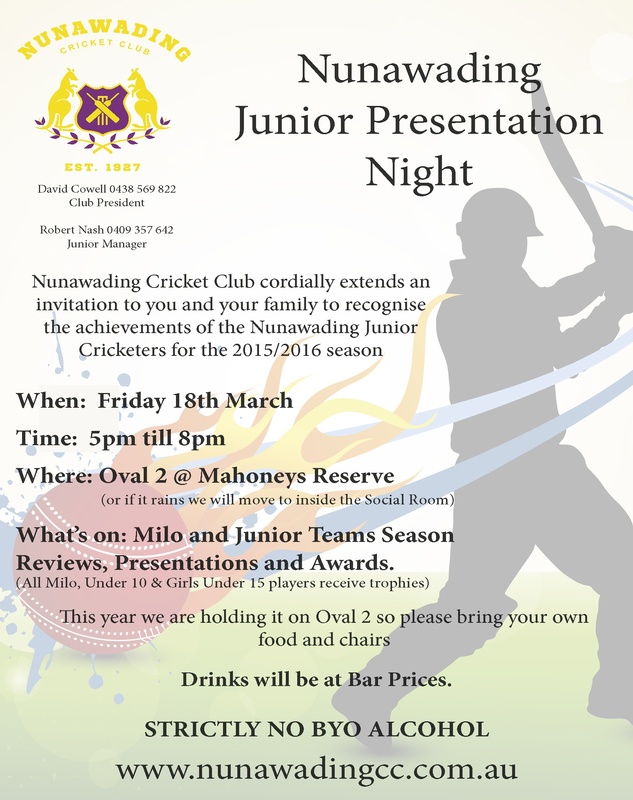 As mentioned, our Presentation Night will be on Friday 18 March at Mahoney’s Reserve (invitation attached). I will provide full details of the night next week. Anyone who has ordered club phots, will be able to pick them up on this night!